Date Range Selection: Modeled after Google Analytics, you can enter any start date and end date to create a new graph and summary table. This allows you to generate monthly, weekly, or quarterly graphs. Instant Zoom: Even better than Google Analytics, you can zoom in on any part of the graph by holding down your mouse and selecting that area. The graph then automatically zooms in on the selected area to show more detail. Recalibration: You can remove any line in the graph by clicking on its name in the key to recalibrate the graph with a new Y axis. This can help you remove the effect of data spikes on your graph and compare results of different combinations. One Click Download: You can click the download icon in the top right corner of the graph to download it as a PNG, JPG, SVG Vector Image, and even a PDF file for easy emailing. To show you what the graphs look like, and to give you some ideas at the same time, we thought we’d highlight a few customer success stories. The graph below is from our client, Corazon at Castle Hill, which is one of the best Mexican restaurants in Austin. They don’t use Open Table and thus get a lot more reservations from their website than clients who use both Open Table and Reservation Genie. What we want to point out on this graph is the effect that an active approach to website management can have on your reservations. We remodeled Corazon’s site at the end of September, and you can see a clear jump in reservation traffic from the 15-30 per week range to the 40-60 per week range. Some of the factors contributing to this increase in reservation traffic are the usability boost we gave their site when we rolled out a clean and usable “web 2.0” website. It works and looks great on a mobile phone, Ipad, and 23" monitor. We also added a small explanation about how Reservation Genie works on Corazon’s reservations page. 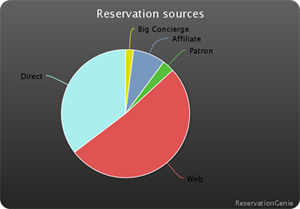 But before doing so, we compared the ratio of the number of people that clicked on the reservations link to the total number of reservations booked on several client websites. This ratio is called the conversion rate, and it turns out the conversion rate is 3 times higher when you offer an explanation about Reservation Genie. It’s now something we implement on all the websites we manage. Taking an active approach to website management and comparing your website statistics to your reservation statistics can really help you optimize your results over time. The graph below shows concierge traffic for a new client in NYC, La Silhouette. They had been a client for about a month and weren’t getting significant concierge traffic from our concierge referral network. That made sense because even though they were one voted one of the best new restaurants in NYC by Zagat, many concierges weren’t aware of them and were in the habit of recommending other, more established names. We suggested they implement a concierge referral contest that awarded prizes for the concierges that booked the most reservations. 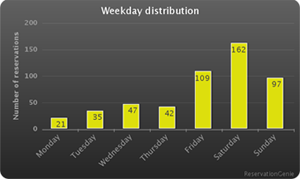 You can see that during the weeks of the contest, their concierge traffic jumped from 1-2 reservations per week to 4-7 reservations per week. Combined with impeccable service and an outstanding menu that generates great guest feedback, a concierge referral contest can help you rise to the top of the concierges’ list of recommendations. Below is a graph of a client’s invoices over time. You can see two spikes in invoice amount in the fall of 2008 and the spring of 2009. Those spikes were a result of Austin Restaurant Week being an affiliate site of Reservation Genie. This led to cover fees for all reservations from the Restaurant Week website. A few clients complained about these fees because they were already paying $600 per event to be part of Restaurant Week. We decided it wasn’t fair for our clients to pay for the same advertising twice, so we created a free booking link that they could give to any website like Restaurant Week. This link enables the restaurant to receive reservations from other websites, track the results, and avoid cover fees. We believe transparency is a powerful feature of Reservation Genie that you don’t see in other reservation systems. Open Table, for example, lumps all affiliate site reservations into one nebulous source labeled the “Open Table Network,” which keeps restaurants from noticing overlapping or duplicate costs. With Open Table, being part of something like Restaurant Week can cost considerably more than just the participation fees if you’re racking up cover fees as well. If you have questions or need help with graphs, feel free to send us an email or post a comment. We enjoy helping clients dig deeper into reservation management. If you like our transparent practices, we’d really appreciate you sharing this post on Facebook, Twitter, Google +, etc.